The eggs were all on the egg shelf of my refrigerator. They were throwing a big party. It was late and I kept on having to go to the fridge and tell them all to keep it down. At one point, I heard a splat. It sounded like my brain was on drugs. And then everything got quiet. 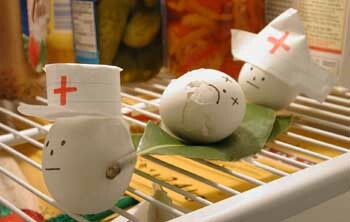 I looked in the fridge to see what they were up to, and this is what I saw. DigitalFoto magazine held a contest each month. They would provide 3 abstract things that should be in a photo. The best photo wins something. So for this month, the 3 items were eggs, leaves, and hats. So a boiled some eggs, found some leaves, and made some hats. I spent several hours working on it. I had to take a good photo with the right light, sharpness, etc. Then I had to PhotoShop the picture to take out all the tape I used to attach the eggs to the leaves. I was ready to submit, and I went to the web site to submit my photo. Unfortunately the magazine had just folded the week before. If that weren't bad enough, the hard drive that contained the original PhotoShop files died. Luckily I have a large JPEG lying around.